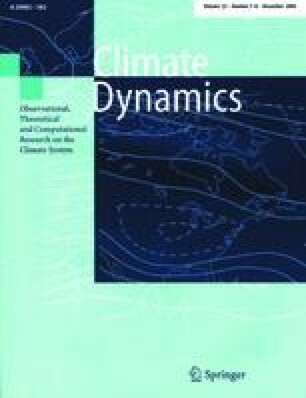 The authors are grateful to Laurent Terray at CERFACS, Toulouse, for the initial set-up of the OASIS coupler in Bergen, to Michel Déqué and David Salas Mélia, Meteo-France, Toulouse, for providing technical assistance and support, and to Lennart Bengtsson, MPI, Hamburg, for a series of useful discussions and thorough guidance during the work. Constructive criticisms and suggestions made by Ronald J. Stouffer, GFDL, Princeton, during the review process, are greatly appreciated. The development of the Bergen Climate Model and the model integrations have received support from the Research Council of Norway through the RegClim project, the "Spissforskningsmidler" (MB), and the Programme for Supercomputing. Additional funding has been received from the Board of Marine Sciences, University of Bergen, and the European Commission funded project PREDICATE (EVK2-CT-1999-00020) (HD). This is contribution A0013 from the Bjerknes Centre for Climate Research. The thermodynamic component of the sea-ice model has one ice layer and one snow layer. The temperature is determined at the ice-snow and the snow-air boundaries, assuming linear temperature profiles in the interior of the ice and snow, and with the freezing temperature of sea water as a boundary condition at the bottom of the ice. The temperatures are then diagnosed by balancing the heat flux budget at the snow-air boundary. The term ∂Qns n /∂T s , delivered from the atmosphere model, is also used by the coupler to modify the distribution of non-solar heat fluxes received by ocean cells covered by the same atmosphere cell (see Sect. 3).